Sotsugyou desu ne (卒業ですね lit. Graduation, is it not?) is a bonus CD sung by AZALEA, a sub-unit under Aqours. 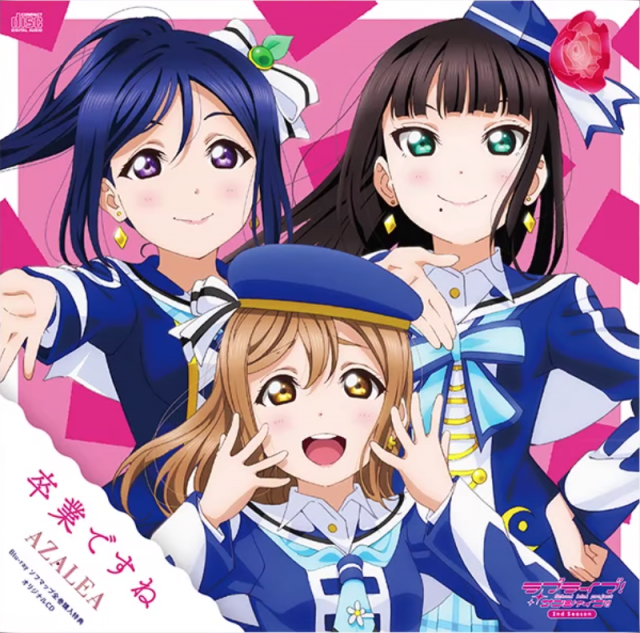 The group consists of Kanan Matsuura, Dia Kurosawa, and Hanamaru Kunikida. The CD is a bonus for purchasing the entire Love Live! Sunshine!! Season 2 Blu-rays from Sofmap (ソフマップ). The song is written by Aki Hata, composed by Hiroyasu Hayakawa, and arranged by TECHNOBOYS PULCRAFT GREEN-FUND.